CANTON, MA (January 6, 2014) -- To help guests eat better and keep running smartly throughout 2014, Dunkin’ Donuts, America’s all-day, everyday stop for coffee and baked goods, is kicking off the New Year by expanding the brand’s DDSMART® menu. Leading off the brand’s lineup of new better-for-you choices, available any time of day, Dunkin’ Donuts has introduced the Sliced Turkey Breakfast Sandwich. Served oven toasted on a brand new Multigrain Flatbread, the Sliced Turkey Breakfast Sandwich, at 310 calories, features three slices of turkey, an egg and a slice of reduced fat cheddar cheese. The sandwich is also available as a Wake-Up® Wrap, at 160 calories, served with egg, cheese and one slice of turkey on a warmed tortilla. 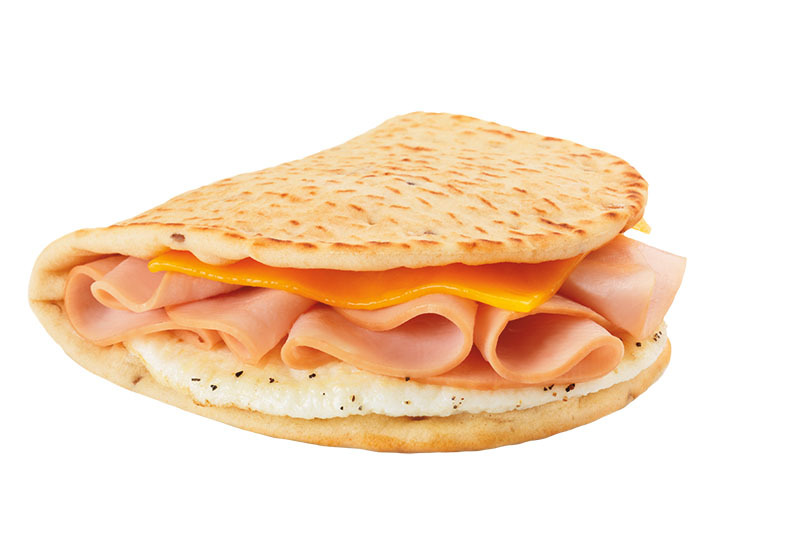 Also, any Dunkin’ Donuts breakfast sandwich can be served on the new Multigrain Flatbread. To help bagel lovers ring in the New Year, Dunkin’ Donuts has also rolled out a new Whole Wheat Bagel. This delicious, better-for-you bagel option, at 320 calories, pairs perfectly with any of Dunkin’ Donuts’ Reduced Fat Cream Cheese spreads. Both Dunkin’ Donuts’ new Whole Wheat Bagel and new Multigrain Flatbread have earned the Basic Stamp from the Whole Grains Council, a certification for products containing at least half a serving (8 grams) of whole grain. The Whole Wheat Bagel has 60 grams of whole grain, and the Multigrain Flatbread has 16 grams of whole grain. Dunkin’ Donuts’ Brown Sugar Flavored Oatmeal with Dried Fruit Topping and Original Oatmeal with Dried Fruit Topping each contain 44 grams of whole grain and have earned the 100% Stamp from the Whole Grains Council, which signifies that all grains in the product are whole grain. Dunkin’ Donuts’ DDSMART menu of items provides guests with better-for-you options without compromising taste, quality or value. All Dunkin' Donuts' DDSMART items meet at least one of the following criteria: 25% fewer calories; 25% less sugar, fat, saturated fat or sodium than comparable fare, and/or contain an ingredient or nutrient that is nutritionally beneficial, such as whole grains. DDSMART food and beverages have fewer than 400 calories, including Dunkin’ Donuts’ Turkey Sausage Breakfast Sandwich, Wake-Up® Wraps, Veggie Egg White Flatbread, Hot Tea, and Latte Lites.